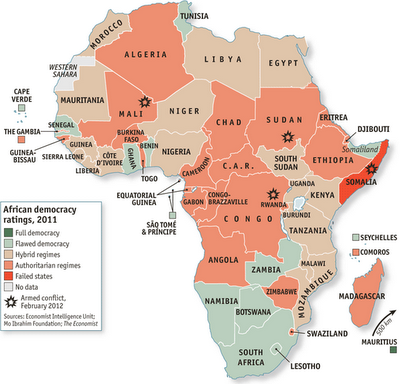 Maximizing Progress: African Democracy ~ 3 Steps Forward, 2 Back? "...many Africa-watchers perceive a gradual erosion of democratic standards. [...] African elections do not necessarily produce representative governments. [...] Academic studies also paint a gloomy picture. [...] Southern Africa, historically the best-performing region, is now a problem child. [...] Still, Africa has come a long way..."